Bob and I are excited to share with you, all of our current news at Notre Vue Estate. It has been a busy year! We held our first Winemaker's Dinner on September 15th at our newly completed Block 23 Terrace. We proudly served our award-winning wines, which were perfectly paired with food by The Cook and the Drummer; a good time was had by all! The view from the Block 23 Terrace is spectacular and is now available for your enjoyment to host your own special occasion, or to be a part of one of our many upcoming events. You can view photos of the evening here! We want to thank you for being part of our journey and commitment to creating many more lifetime memories together. By the time you read this, we will be just about done with Harvest 2018 and that means another summer has come and gone. I confirmed that this morning by noting a slight nip in the air. I even had a sweater on! The weather is cooling, the days shorter, leaves are changing color ... what better time than now for one last backyard barbeque party? And what better wine to welcome your guests with than the 2014 Notre Vue White Blend! This seductive wine will stun and amaze your friends, making you look like a world-class sommelier. It is a blend of Chardonnay and Viognier. While neither is an unusual varietal by any means, a blend of the two is not common. But what a wine the two make together! Chardonnay offers the classic ripe pear and baked apple notes with a touch of spice and vanilla from the French oak barrel aging. Add to that a little Viognier offering floral notes, perfume and hints of white nectarine and the result is a very aromatic and complex wine, perfect for an early fall evening in the garden. And if you are indeed barbecuing, then Balverne's 2014 Cabernet Sauvignon is just the ticket. Rich and concentrated with all the great character that Cabernet Sauvignon has to offer, this wine benefits hugely from the addition of a little Malbec. Malbec does particularly well on our property giving us a big, bold, spicy wine loaded with notes of violets and black cherries. If the coolness of the evening takes you inside to enjoy roast Muscovy duckling or a well-marbled, perfectly cooked standing rib roast, let's pair that up with a glass of Notre Vue's 2014 Bordeaux blend. This classic blend of Cabernet Sauvignon, our lush Malbec and a hint of Cabernet Franc was aged in 100% new French oak of the highest caliber all designed to complement the beautiful characters of the best fruit the Estate has to offer. This is a serious wine, one that drinks well today, but will continue to deliver over the next decade. Don't hesitate to tuck a case or two in the cellar. Lastly, I am incredibly proud to be releasing the 2015 vintage of our Notre Vue Bordeaux blend. Aged for 2 years in 100% new French oak, the blend utilizes all five of Bordeaux's classic varietals - Cabernet Sauvignon, Cabernet Franc, Malbec, Merlot, and Petit Verdot. In one of the final vintages of the California drought, we were rewarded with small berries yielding concentrated flavors and an impressive tannic structure. With a 90-point score from Robert Parker, the new release of the Notre Vue Bordeaux is certain to be satisfying palates for years to come. We look forward to welcoming each and every one of you here to the Notre Vue Estate property. See you soon? Until then ... a votre santé! Complex, ageable, balanced, and delicious; the 2014 Bordeaux style blend has all of the classic hallmarks of an incredible bottle of wine. Dark fruit permeates the blend with notes of blackberry, plum, black cherry and currants radiating from the glass. Two years in French oak deliver a touch of spice and vanilla that linger into the finish. Pairing beautifully with duck breast and short ribs alike, the 2014 Bordeaux Style Blend is the perfect wine to keep you warm this winter. 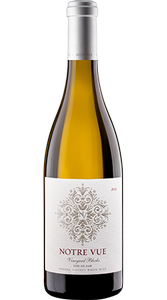 Chardonnay and Viognier make an unlikely team in this sumptuous blend. Lush aromatics of Bose pear, white lilac, and lemon zest deliver elegance and nuance before the first sip reaches your lips. A balanced touch of buttered toast and spice carry through the mid-palate, mingling with Granny Smith apple on the wine's long, subtle finish. The 2014 Notre Vue White Blend is the perfect companion to seared scallops with wild mushrooms. This Cabernet is richly layered with flavors of spice: vanilla, allspice, cinnamon, and cardamom, blended with hints of berry, raspberry and cassis flavors from the grapes. The lengthy finish is smooth and well-balanced. This exotic mélange continues to develop during bottle aging. A noteworthy wine will change as you consume it - every swirl and sip will bring forth a new sensory aspect of the wine. There are few things more exciting around the winery than the release of new wine. After waiting an entire growing season, two years as the wine developed in the barrel, and another year in bottle, the 2015 Notre Vue Bordeaux blend is definitely worthy of patience. With notes of cassis, black currants, tobacco, and plum, the blend finishes with a perfect balance of tannin and acid. Hi ... Jen here, I am the hospitality and events manager here at Notre Vue Estate! I wanted to let you all know that we have some exciting upcoming events to share. Whether at the winery or out in the community, please join us and let's have some fun together! We will be announcing our 2019 Calendar of Events soon. We also have our Block 23 Terrace completed in addition to our Notre Vue Room and pond-side Pavillions; we can't wait to host tastings and events for you and your guests. Please visit our events page Upcoming Events. Contact Jennifer Hanshew at 707.433.4050 x126 or jennifer@notrevueestate.com. An outstanding wine calls for an outstanding dish to match. With wine as bold as the Notre Vue Bordeaux style blend, nothing compares like a perfect cut of steak. The robust tannic structure is perfect for the richness of the filet, while the blue cheese and port wine sauce provide powerful flavors to compliment the wine. 1. Saute onion, garlic, and thyme in butter until onions are tender. 2. Stir in beef broth and port wine, bring mixture to a boil. Reduce down to ½ cup. Set sauce aside. 4. In a cast iron skillet, heat oil over high heat and sear both sides of the filets until brown. Place skillet in oven. 5. Roast fillets in the oven for 15 minutes for medium-rare. 6. Remove skillet from the oven and preheat the broiler. 7. Mix blue cheese and breadcrumbs together and sprinkle over fillets. 8. Place filets under the broiler for 3-4 minutes or until the cheese is browned and bubbling. Let sit for 10 minutes. 9. 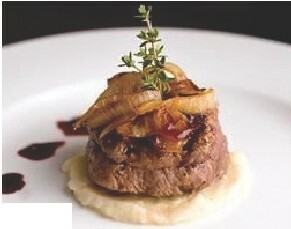 Serve with warmed port wine sauce. As a winemaker I would never, ever suggest, just one week into harvest, that this might be a “perfect vintage.” Why jinx it? Why take the risk of inviting Mother Nature’s wrath so early on when we have so many weeks to go? So, I won’t. However . 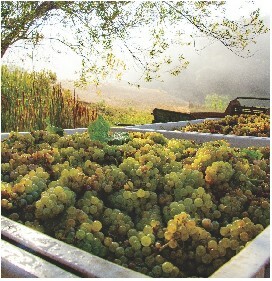 . .
We have both lots of Sauvignon Blanc in the barn. Perfect numbers. Our first Pinot Noir came in today and I was just handed the lab report for the lot. Perfect numbers. By “perfect numbers” I mean the sugar and acid content are ideal for making stellar, well-balanced wine with minimal winemaker intervention. We won’t have to adjust the sugar or the acid and that’s a good thing. Natural is always preferred over making any sort of add or adjustment. Perfect. And the weather? The forecast is for excellent ripening weather over the next few days then a bit of a cool down that will slow sugar development but will allow flavors to continue to mature. Sunny and dry. Perfect. Yet I am petrified! How long can “perfect” continue? I’m hoping for about another eight weeks. That’s all I ask. But that is a long time this time of year. There is no reason a heat wave won’t hit us in the near future. The riper fruit gets the more susceptible it is to damage by extreme heat. So, no heat wave, please. Or, heaven forbid, we should get some rain. Ripe fruit, with softer skins, is very susceptible to damage by mold. And mold thrives in moist, damp air. So, no rain, please. Just perfect. That’s all I ask. This is the life of a winemaker. Faced with perfect conditions for the foreseeable future, here I sit worrying. I’m trying not to think about the weather, though I did just check the forecast again minutes ago, for the nth time today. And its only 10 AM. The good thing is that, whatever comes our way, I’m ready and that does take the edge off things a bit. This is my thirtieth harvest. If I don’t know how to handle a little adversity by now, there is no hope for me as a winemaker. I keep thinking about the Farmer’s Insurance commercial “We know a thing or two ‘cause we’ve seen a thing or two.” So true. I’m ready for anything. I hope. The perfect vintage? Could be. Too early to tell but things are looking mighty good out there right now. Though this winemaker, for one, will not ever say that. Not now. Nope. No way. Harvest 2018 is underway! The first of our Balverne Sauvignon Blanc grapes came in this morning in stunning fashion. We’ve had a beautiful growing season to date with just a bit of a cool snap for the last week or so. 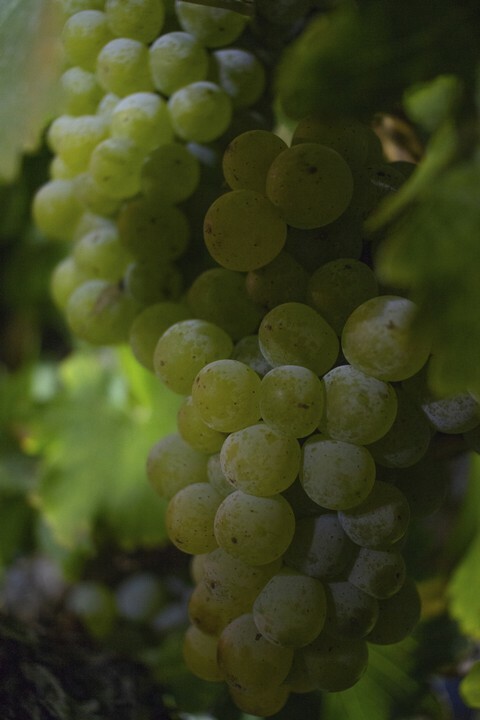 While sugars might not accumulate rapidly in the cooler weather, the flavors do continue developing, the result being that I found this year’s Sauvignon Blanc ready to harvest at lower Brix levels (sugar content) than usual. Why is this good? Because it translates to lower alcohols in the finished wines. You may have heard the adage that “wine grapes benefit from a long hang time.” That means the longer the grapes hang on the vine, the greater the chance flavors will be more concentrated in the fruit at harvest, resulting in a more flavorful wine. While we’re blessed in California with beautiful, warm summers, the heat can sometimes be a little too much of a good thing making sugar accumulation (and therefore potential alcohol levels) run ahead of flavor development. The ideal situation, obviously, is to have maximum flavor development just as the grapes reach that magical sugar content. For me as a winemaker, a lower alcohol is important as it helps keep the wine “in balance.” Put another way, a wine with an excessively high alcohol will taste “hot” or have an alcohol “bite” to it that may not be pleasing, and that higher alcohol may mask some of the more delicate fruity and floral notes of a wine. 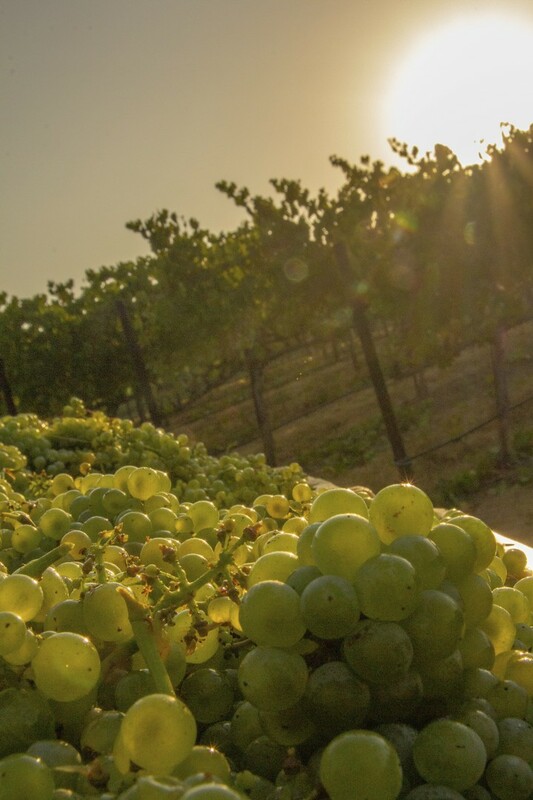 Sauvignon Blanc, known for its lighter body and bright, crisp fruit aromas and flavors, most definitely benefits from these lower alcohol levels. Any winemaker anywhere in the world will always tell you without skipping a heartbeat that “This vintage is the best we’ve ever seen!” Well, you know what, I’ll say that right now about Balverne’s 2018 Sauvignon Blanc. And we haven’t even made the wine yet! Make a note on your calendars to visit Notre Vue Wine Estate in April of next year to taste Balverne’s 2018 Sauvignon Blanc. Trust me, you’ll be stunned! And happy you visited! 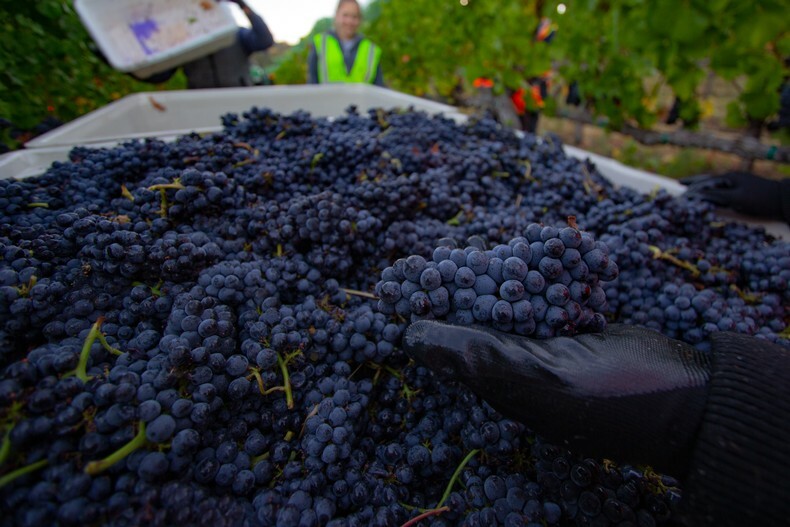 Keep tuned to this blog to hear about our upcoming Pinot Noir harvest. The weather for the foreseeable future is ideal and the Pinot Noir grapes are already tasting simply fantastic. In fact, I’m thinking this vintage will be the best we ever seen! A votre santé, mes amis! At least once a year a winery is faced with the challenge of bottling its wine as it is pretty hard to sell it otherwise. Admittedly this should not be a big deal and generally it isn’t. But bottling is not without its inherent pains and worries. Its not a part of winemaking that any winemaker enjoys. Or is it? 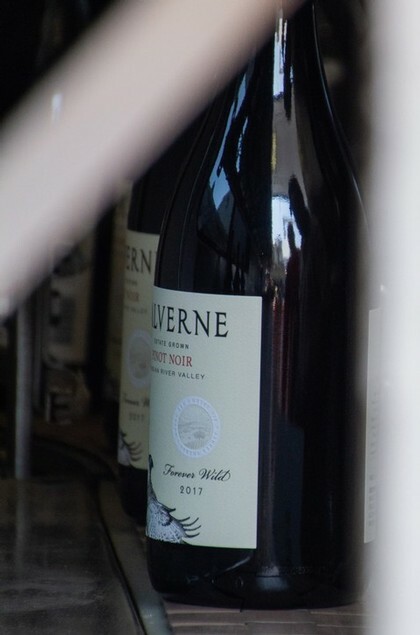 As we gear up to bottle our Balverne Chardonnay and Pinot Noir here at Notre Vue this fall, we’re attending to lots of little details and making sure everything is in place for a successful bottling run. We have our labels, corks and capsules. Glass supposedly arrives next week. We are scheduled to bottle just after the glass arrives. All this is carefully choreographed so that everything comes together perfectly and all on time. We need to make sure the wine is ready, too. Following any final blending we will address the acidity along with the level of residual sugar and adjust each as necessary. The wines will be cold stabilized to prevent them from throwing tartrate crystals and will be heat stabilized to prevent protein hazes from developing. Fining might be done to soften tannins and/or to remove bitter components from the wine. One last decision to be made will be whether or not to filter. But once this necessary evil is complete, however challenging it might have been, the bottling line cleaned up and the exhausted crew headed home, you sit at your desk finishing up paperwork and look up at a few samples of the day’s bottlings each with perfect capsules, straight labels and all filled with delicious wine ready for wine lovers everywhere . . . life is suddenly all good again. Grab a bottle . . . I think you’ll agree! Here we go again, kids! We’re gearing up for Harvest 2018 and I suspect we will have grapes rolling in in just a few weeks. It seems like I just finished writing a blog about Harvest 2017 . . . how time flies when you’re having fun! Always a great time of year for a winemaker, harvest brings long days and hard work for sure, but it also brings a new beginning, a new start, a chance to try the latest and greatest ideas, a chance to make yet again another great wine. There is excitement in the air like no other time of year. The crush pad is set up and ready. Must lines, pumps and hoses are being cleaned and sanitized. The press has been checked. We’re stocking up on yeast and making sure the lab is prepped. Interns are getting last minute instructions on how things will roll, what their duties are and how to do everything we’ll need to do. And all of you reading this blog, all our Notre Vue and Balverne fans out there, this is your chance, too, to get involved, to get excited about harvest. Being a smaller operation, I have the time to welcome you to the winery personally and to guide you through the activities of the day. This is your once-a-year chance to taste harvest-ready grapes, to see us crushing fruit, making juice, filling barrels and to taste the juice and fermenting wines. Don’t pass it up! We’d love to have you visit the winery, be part of harvest and to stay for a tasting of our current releases. See ya soon ?? What in the Blazes is Happening? If you live in California you just know we’re going to have some wild fires every year. With all our beautiful forests along with our low humidities and high temperatures, fires are simply inevitable. But, holy moly, this is getting crazy! Last year you will recall wild fires devastated Sonoma County with Santa Rosa being particularly hard hit. This year Mendocino and Lake Counties are ablaze. At last look, I counted 18 major fires up and down the state. A horrendous number of acres have burned, countless structures destroyed and, sadly, all too many lives lost. Given that last thought, it is hard now to switch to winemaking and to comment on the damage wild fire smoke can do to wines. It all seems so trivial in light of the dire effects the fires have on so many peoples’ lives. The warmest and driest part of the year here, when wild fires are at their height, typically coincides with our grape harvest. As grapes ripen and skins soften, the fruit becomes very susceptible to damage by smoke. “Smoke taint” is caused by grapes absorbing volatile phenolic compounds produced when wood burns. These phenolic molecules then bind to sugars inside the grapes to form glycosides. Once these glycosides are formed, the original volatile phenolic compounds can no longer be detected by smell or by taste. There is no perceived smoke taint at that point. The problems begin to surface as the grape juice is fermented and wine is made. As the wine develops and ages the acidity in the wine begins breaking down these glycosidic bonds releasing volatile “smoky” phenolics back into the wine. It is these compounds that give a “smoke tainted” wine its characteristic old campfire smell or odors reminiscent of a cigarette ashtray. These are not pleasant smells or tastes and are not to be confused with the lovely toasty, smoky notes associated with some oak barrel treatments. A wine can even smell just fine but, when consumed, taste of these campfire/ashtray characters. The thought here is that enzymes in your mouth are breaking the glycosidic bonds and releasing volatile compounds literally as you consume the wine. Though methods are available to rid wines of the volatile smoky compounds, they are by no means 100% effective. While the volatile compounds that exist at treatment time might be removed, more will be released as the wine continues to age. Consecutive treatments are therefore needed and even then there is no guarantee that the problem will have been resolved. Here at Notre Vue Wine Estate, I am happy and relieved to report that we have had no smoke damage to any of our wines produced to date. While we might be surrounded be fires, none is close enough nor the smoke thick enough to have caused any smoke-taint issues. For all of you so negatively affected by the fires, please know everyone here at Notre Vue Wine Estate is praying for your well-being. Our thoughts are with you always. 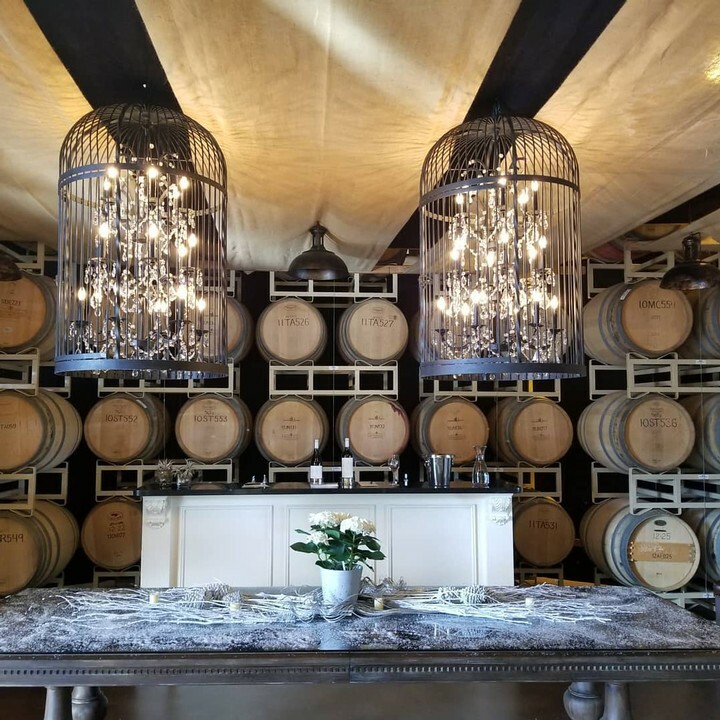 Thank you for joining us for Winter WINEland last weekend - the perfect winter escape to taste current vintages and multiple varitals along Wine Road – Northern Sonoma County! Participants got to taste current releases of both Balverne and our exclusive, limited production Notre Vue Wines in our transformed Winter 'Wineland' tasting room. Click on the image to view photos from the event. We look forward to seeing you again soon! Looking back at 2017...Did Someone Say "FIRE!" Sonoma County is without question one of the most beautiful places in the world. Bound on the west coast by the powerful Pacific Ocean and stretching inland to the majestic mountains, we enjoy a mild, Mediterranean climate in Sonoma. Not too hot, not too cold. About eight months of dry, warm days follow the blustery winter rains. Our grape vines hunker down for the winter and, in their dormant state, are immune to the pounding rains and cooler days. The water table builds holding this precious resource in anticipation of the grape vines’ needs as they spring back to life. The growing season ensues and another incredible vintage is born. There is a reason Sonoma County is respected world-wide for our sumptuous wines. Of course there are variations on the theme. Some summers are cooler than others, some warmer. Some dryer, some wetter. But, all-in-all, a pretty perfect place to grow wine. Wild fires are, therefore, a constant concern here. Even in normal times, without the added challenge of the last few years of serious droughts in Sonoma, the hills are laden with dry foliage and dead trees. Fire danger is always on one’s mind here and every precaution is taken avoid sparking a blaze. The simple task of mowing dry grasses can present a hazard if sparks are generated in the process. What we really don’t need during this very dry time is wind. And certainly not prolonged 60 mph gusts of bone-dry air. Yet that is what we experienced just a month ago. 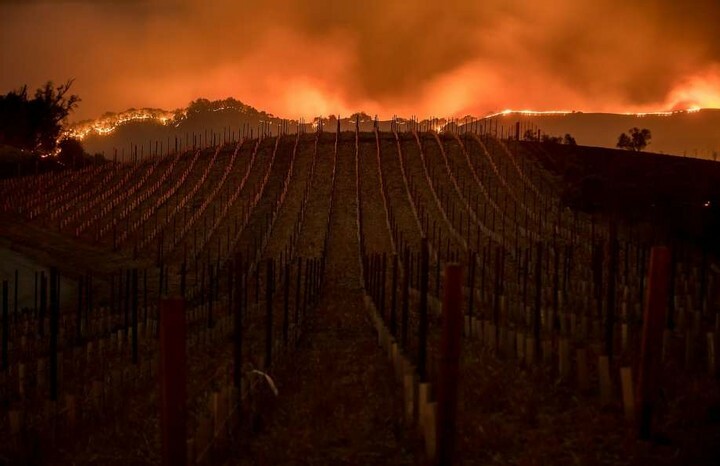 As harvest was winding down, with 95% of our grapes in, Sonoma County experienced its worst wild fires in history. We all know of the horrific damage they caused. As those fires raged, as people lost their homes and as some their lives and their pets, the world moved on. The few grapes still out there continued to ripen though many wineries simply couldn’t bring them in due to lack of power and/or water, if they even had a winery left to work with. 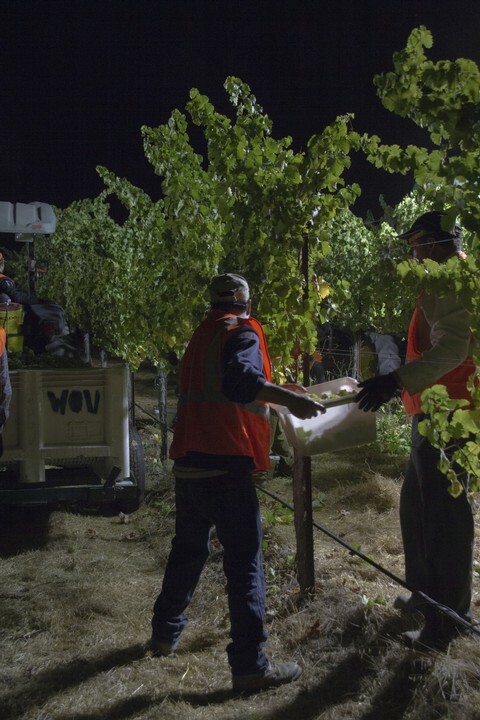 Workers fled to safer places and wineries struggled to finish up harvest. 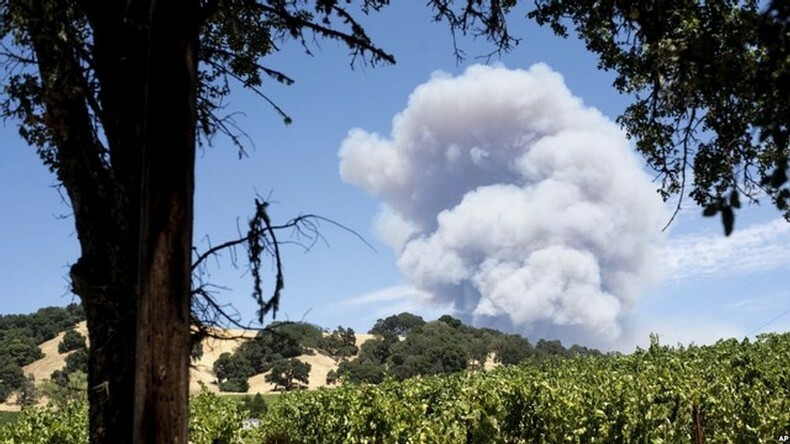 While it seems trivial in respect to the lives and property loses we experienced, winemakers had to be concerned about “smoke taint” as the fires persisted. We were in a huge cloud of smoke in Sonoma for over a week. As the winds died down and that smoke lay over the vineyards, the threat of smoke taint expanded by the minute. A winemaker’s concern is that the smoke settling on the grapes will be absorbed into the skins of the fruit. While a smoky character might not be detectable in the grapes per sé, the threat is that during fermentation the smoke will be released from the skins into the developing wines. In miniscule quantities, compounds in the smoke can add a less than appealing character to wine. Some say that it reminds them of the stench of cigarette ash trays or the smells we associate with a burned out fire pit. Not pleasant at all. There are measures winemakers can take to reduce the incidence of smoke taint in wine during these sorts of trying times. We learned a lot more about this during the Mendocino wild fires of 2008. “We know a thing or two because we have seen a thing or two,” that repeating theme in these blogs, is so true. I am happy to report that, at Notre Vue and Balverne, we had all our fruit in the winery prior to the horrific fires and, therefore, have no issues with smoke taint. And, fortunately, that is the case for most wineries. Two weeks early, these fires would have been devastating to the 2017 vintage. As I type this blog it is gently raining and what a wonderful thing that is! Not only do we need the rain as per usual, but the rains will help the scorched, barren land spring back to life quickly and the golden hills will return to their characteristic emerald green. So we cheer on the rains, we pray for our family and friends with horrendous loses due to the fires and hope that good things will come. And remember, a holiday celebration without a glass or two of Notre Vue or Balverne wine, well, that’s just another scary thought! Wishing you all a happy, healthy, and safe New Years! 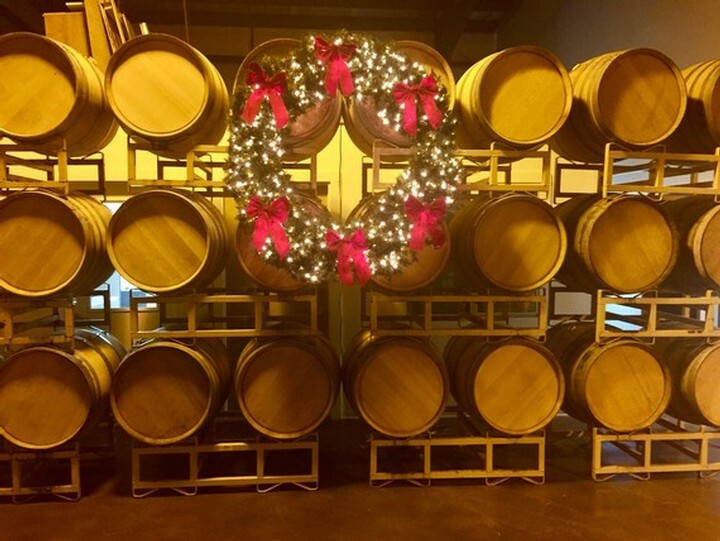 Barrel Tasting at our Winter Wonderland Holiday Party and the "Art of Blending"
Season’s Greetings to all! For those of you that joined us for our recent Holiday Party, it was great to see you all. Those of you that missed it, hang tight, there will be plenty more excitement coming in 2018 and we all look forward to seeing you then! Harvest 2017 is in the house. All grapes are in, all fermentations complete (almost!) and most malo-lactic work is done. We’re busy racking the new wines off the gross lees, adjusting acidities as necessary and returning the young wines to clean barrels for aging. Rarely is a wine bottled without some sort of blending taking place beforehand. Even the Sauvignon Blanc is a blend of two stainless steel fermented tank lots and a bit of barrel-fermented wine. The Rosé, too, is a blend of two different lots. But this is pretty much straight-forward blending. You want to use all the components so you do a trial blend and, if it tastes good, then off you go! Blending the Notre Vue wines in particular, then the Balverne Cabernet and Pinot Noir wines, entails quite a bit more “art.” Let me walk you through my current thoughts regarding the Notre Vue Bordeaux blend. Each month I taste through our whole inventory, lot by lot, watching the maturation process proceed and monitoring the wines for any issues that might need addressing immediately. Concurrently I am always thinking about the final blend and what might work best to create that wine. Does it look like Cabernet Sauvignon will continue to be the base of the blend? And, if so, what lot(s) will be selected for that purpose and in roughly what amounts? Or maybe Malbec is particularly strong. Might it be strong enough to be the base upon which I build the final blend? If so, that Malbec better be concentrated, balanced and loaded with fruit and strong tannins. Winemaker Michael Westrick blending wines right from the barrel at our Winter Wonderland Holiday Party. As those of you who barrel-tasted with us recently noted, it looks like Cabernet Sauvignon will again frame the blend for 2016. And that is by no means surprising even though the Malbec is superb! Cabernet is referred to a the “King of Grapes” for a reason. Our 2016 is powerfully concentrated, packed with dark berry fruit and graced with elegant tannins. And so I will start with Cabernet Sauvignon from Block 37 as the base. But how much? What percent of the final blend? And what will I add to that base? In what quantities? As you might have gathered from above and from your tastings here, Malbec will certainly play a huge role in the 2016 blend. 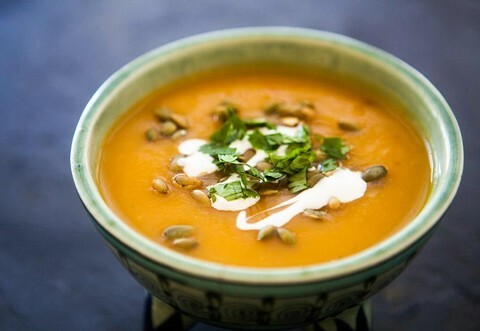 It is particularly lush and loaded with spicy, aromatic black fruit. Petit Verdot is commonly used in Bordeaux-styled blends to add structure and inky-dark color. Our 2016 Petit Verdot fits the bill perfectly and so will also play an integral part in the blend. Merlot? Cabernet Franc? How much new oak? What coopers will be included? What does this all mean? And how will you actually “know?” The answer to those questions lies in the blending process. This is where art takes over from the science, where years of experience pays huge dividends. I will sit down in a room by myself, with samples of the components available, and literally start tasting trial blends of “some of this with a bit of that.” This is exactly like building a spaghetti sauce, starting with ground beef, adding tomato sauce, throwing in onion and garlic, adding basil or maybe oregano, fine-tuning with rosemary and thyme, and finally completing the sauce with a bit or salt and/or lemon juice. Exactly the same process in blending a wine but it takes much more time. After tasting a series of trial blends, I will then set up a series of new blends to taste, trying to hone in on that one blend that always surfaces as the best in each flight of trials. When that starts happening, I’m done! Or am I? The next step is to take a sample or two home and taste the trial blends with food. Debbie will taste them with me, too, and offer thoughts. Does the blend work? Is it balanced? Does the tannin need adjusting? Are the aromatics attractive? Is the fruit strong and defined? 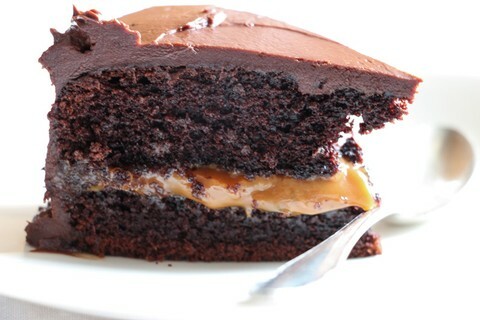 And, the final question, does it taste good? Simple final question but not always easy to answer. And so it goes. It may go quickly with the final blend appearing quite early in the process. In tougher vintages the trial blending may go on for weeks. Ultimately, one way or another, one blend will stand out as being the best. When that day arrives, when that best blend surfaces, we will physically assemble the parts in a big tank and “make the blend.” And that is a bit of a stressful day for a winemaker as there is no turning back once the blend is made. I hope that gives you a bit of an idea of what the blending process entails. In 2018 we are hoping to offer a “Blending Seminar” here at the winery. This is something you do not want to miss as you’ll have a chance to work with five different wines and to come up with your own unique blend. We’ll then taste your blend against those of the other guests.